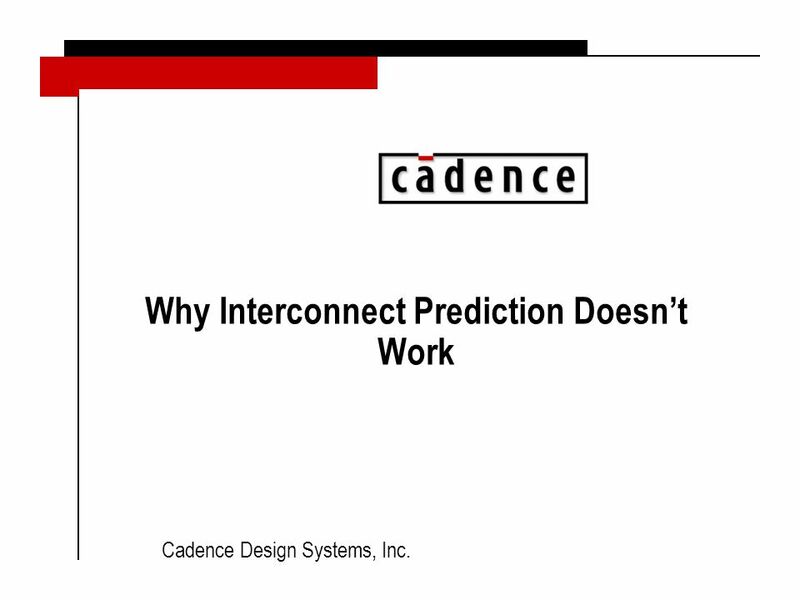 Cadence Design Systems, Inc. Why Interconnect Prediction Doesn’t Work. 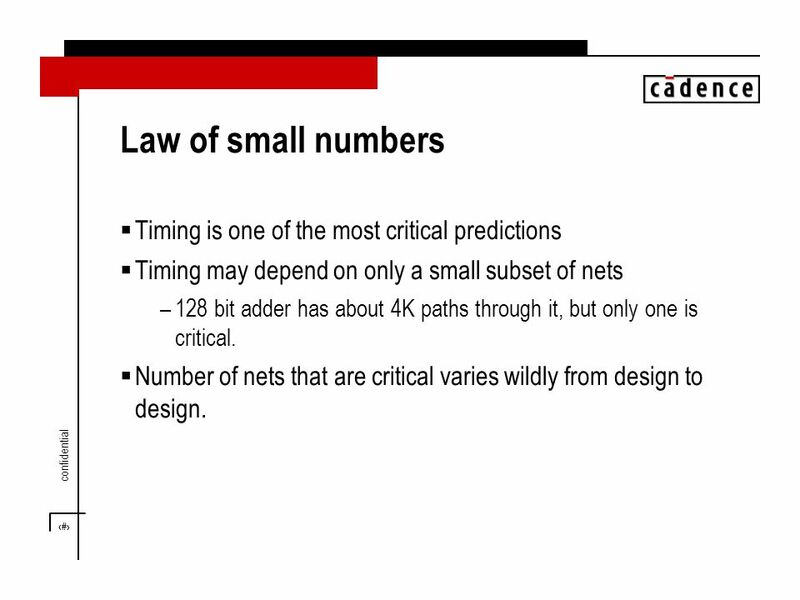 7 7 confidential Law of small numbers  Timing is one of the most critical predictions  Timing may depend on only a small subset of nets –128 bit adder has about 4K paths through it, but only one is critical. 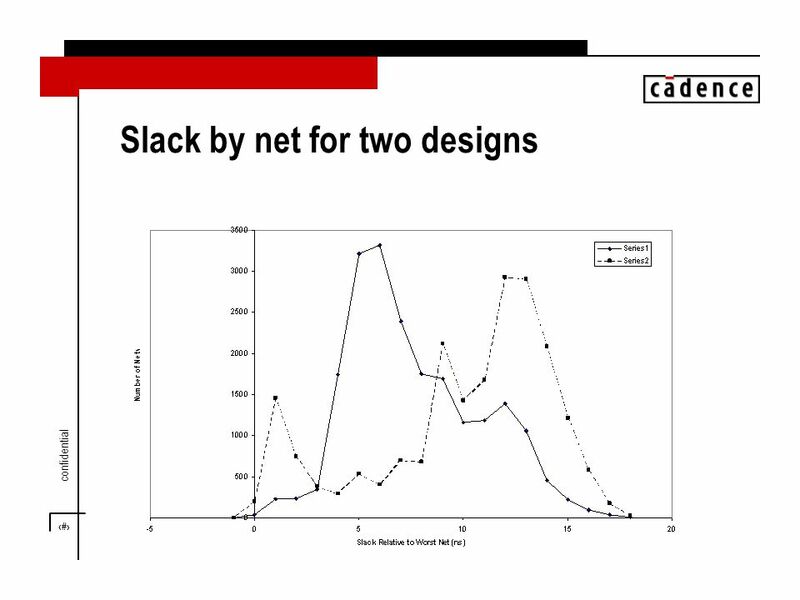  Number of nets that are critical varies wildly from design to design. 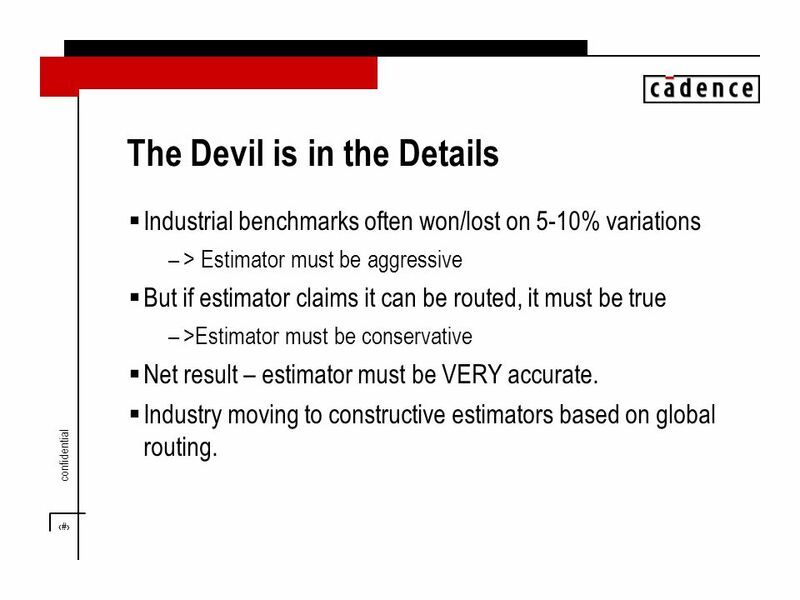 11 11 confidential The Devil is in the Details  Industrial benchmarks often won/lost on 5-10% variations –> Estimator must be aggressive  But if estimator claims it can be routed, it must be true –>Estimator must be conservative  Net result – estimator must be VERY accurate. 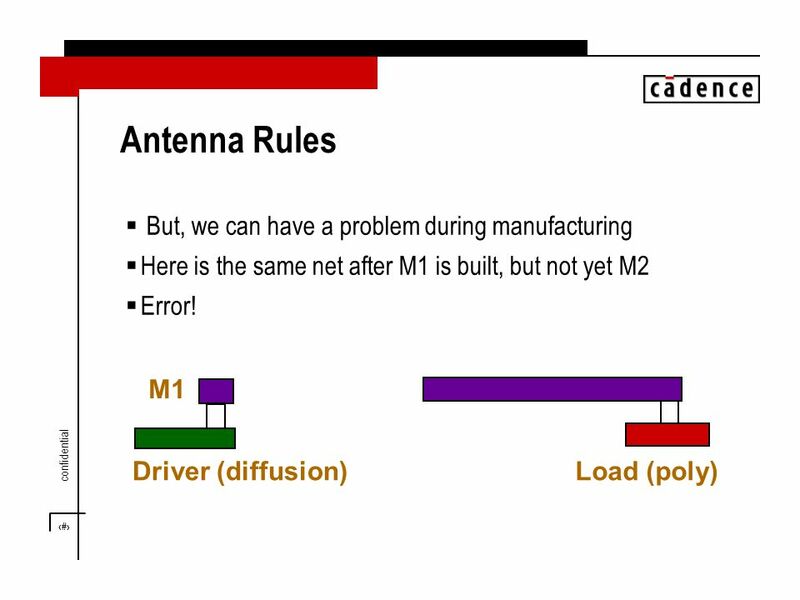  Industry moving to constructive estimators based on global routing. 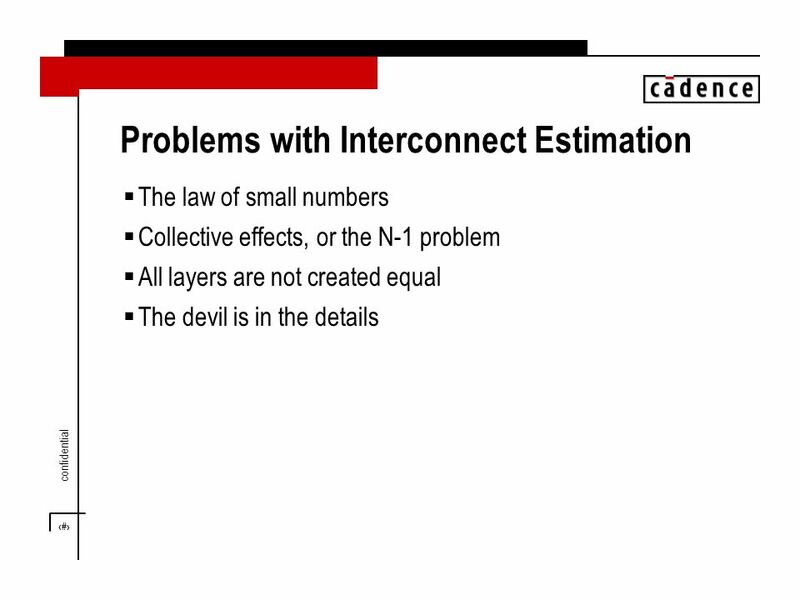 25 25 confidential Can the estimators be upgraded? 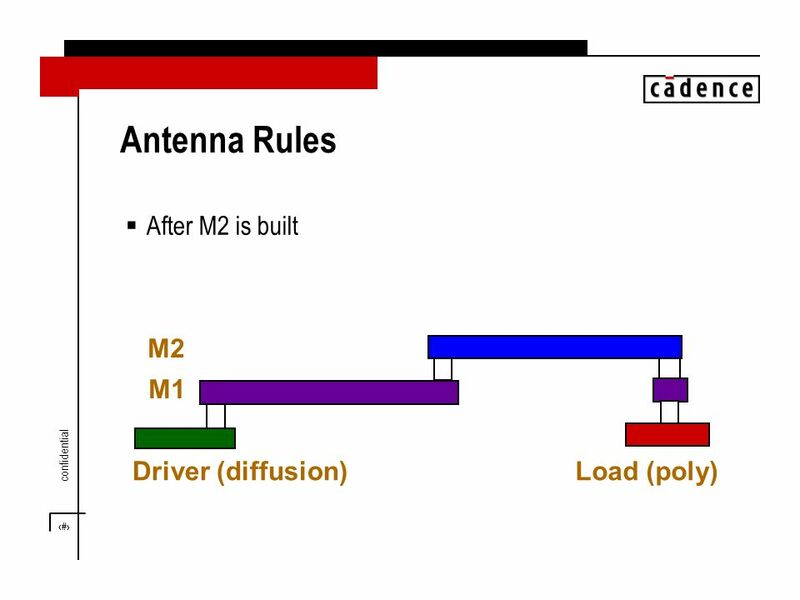  Need to add placement information  Need to do layer assignment  Need to generate Steiner routes respecting capacities  Need to look at ‘relevent’ routing details  Need final router to follow previous decisions  But this is exactly a global router! 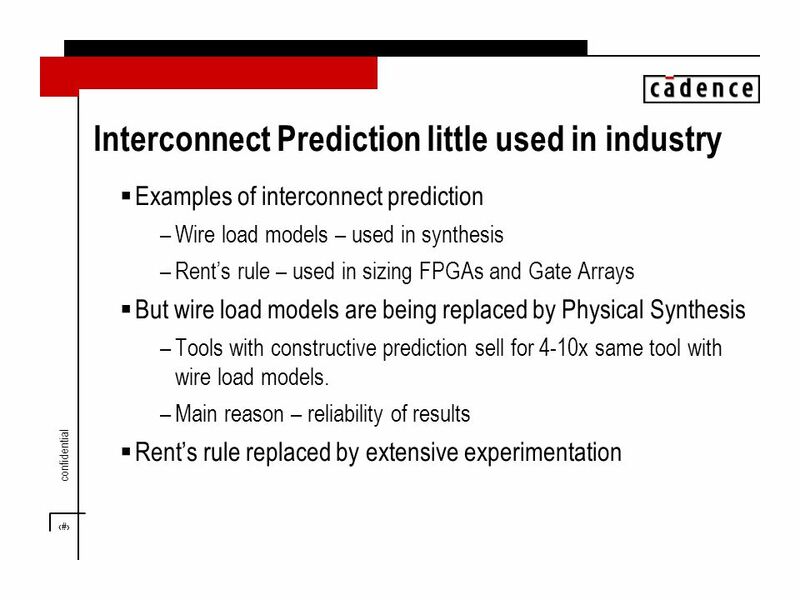 27 27 confidential Conclusions from previous slide  Wire load model problems –Lots of scatter –Systematically pessimistic for critical nets and optimistic for non- critical nets. 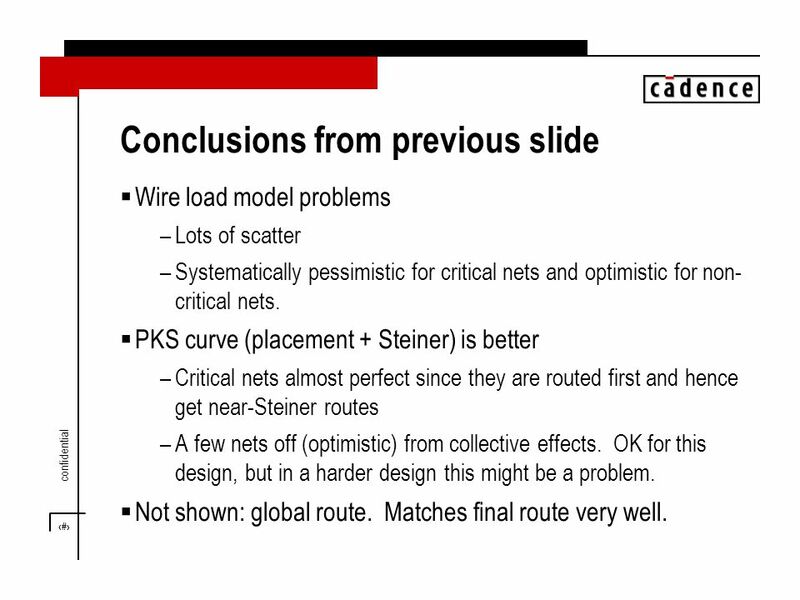  PKS curve (placement + Steiner) is better –Critical nets almost perfect since they are routed first and hence get near-Steiner routes –A few nets off (optimistic) from collective effects. 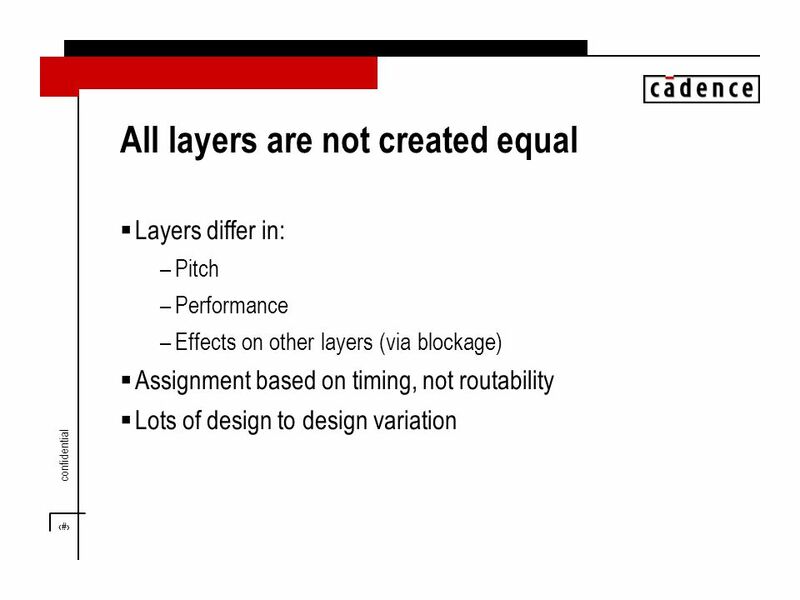 OK for this design, but in a harder design this might be a problem. 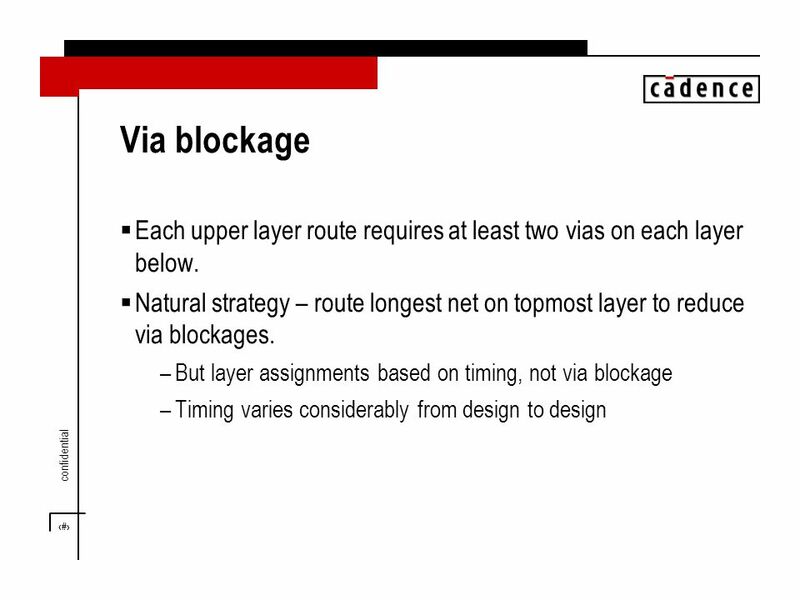  Not shown: global route. 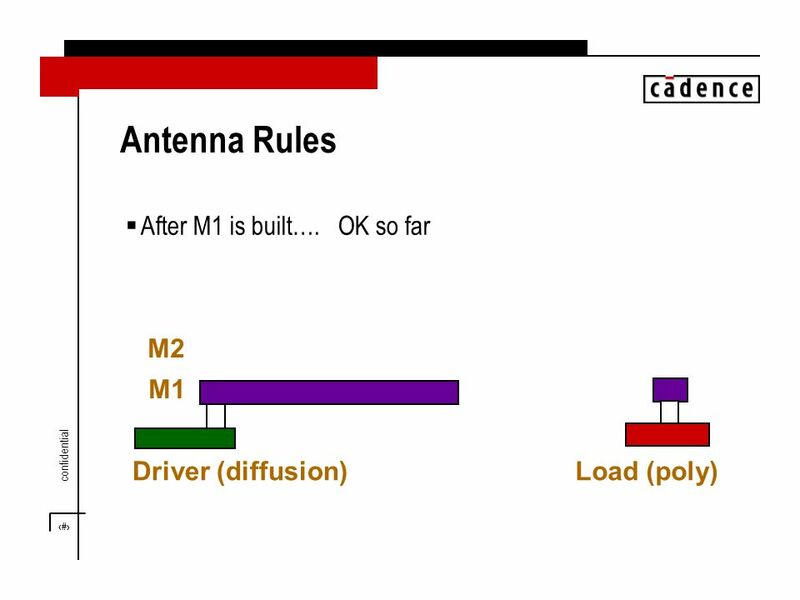 Matches final route very well. 29 29 confidential What are people doing instead? 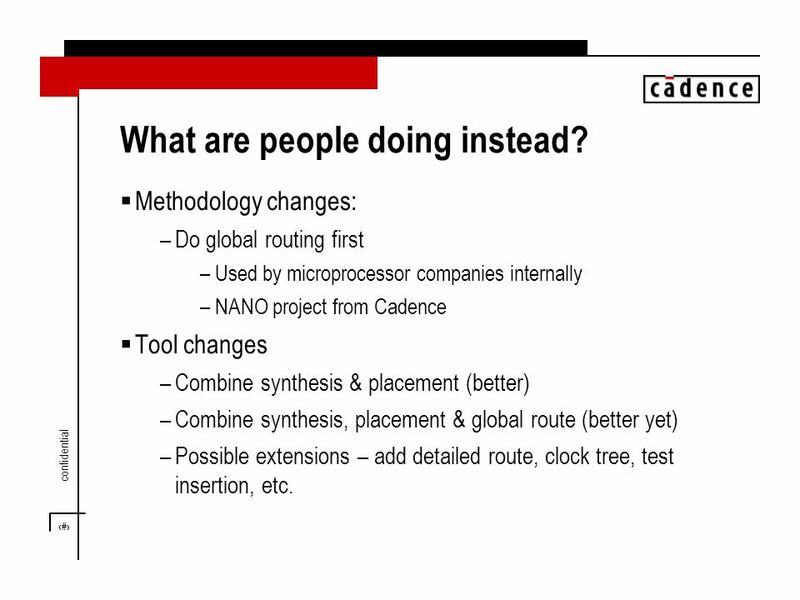  Methodology changes: –Do global routing first –Used by microprocessor companies internally –NANO project from Cadence  Tool changes –Combine synthesis & placement (better) –Combine synthesis, placement & global route (better yet) –Possible extensions – add detailed route, clock tree, test insertion, etc. 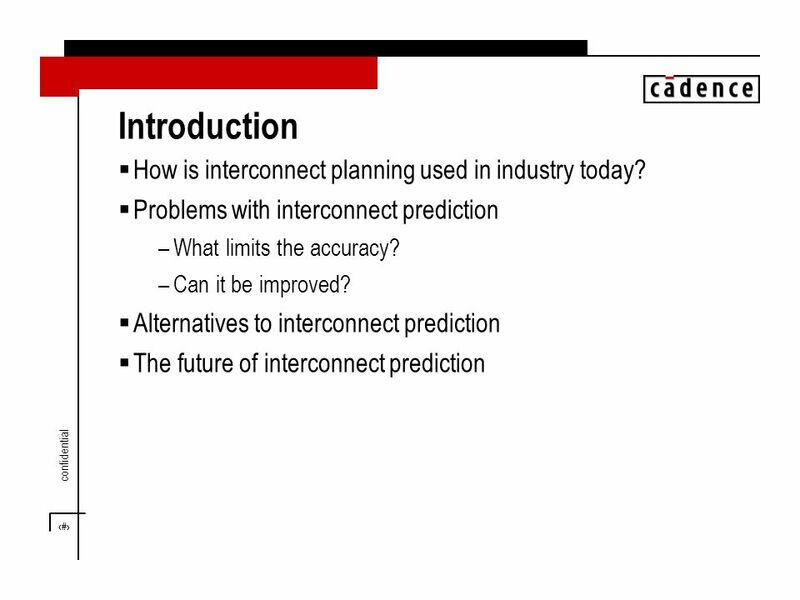 Download ppt "Cadence Design Systems, Inc. Why Interconnect Prediction Doesn’t Work." Native-Conflict-Aware Wire Perturbation for Double Patterning Technology Szu-Yu Chen, Yao-Wen Chang ICCAD 2010. 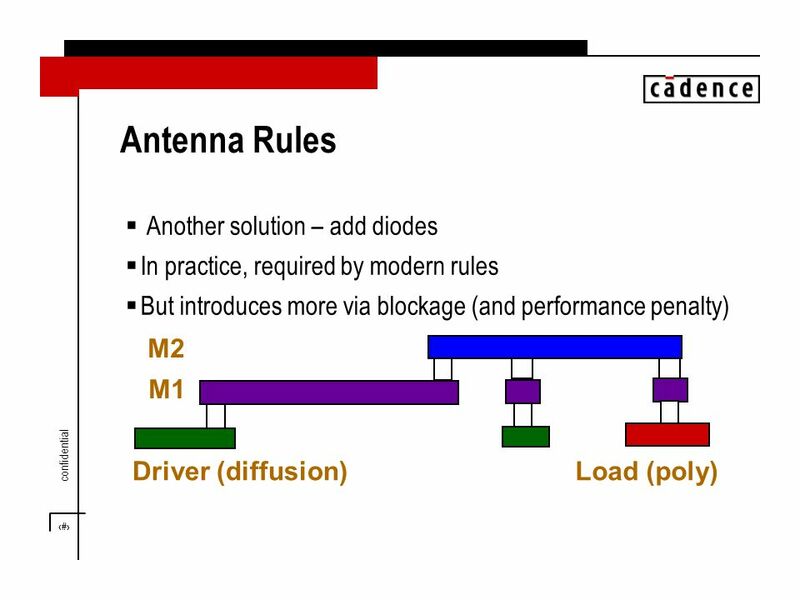 A Routing Technique for Structured Designs which Exploits Regularity Sabyasachi Das Intel Corporation Sunil P. Khatri Univ. of Colorado, Boulder. 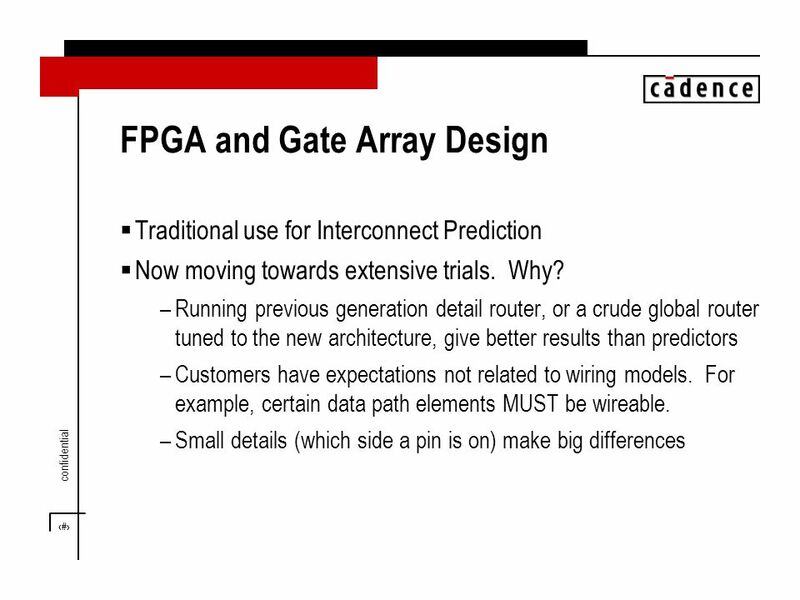 Buffer and FF Insertion Slides from Charles J. Alpert IBM Corp.
Hsi-An Chien Ting-Chi Wang Redundant-Via-Aware ECO Routing ASPDAC2014. Ripple: An Effective Routability-Driven Placer by Iterative Cell Movement Xu He, Tao Huang, Linfu Xiao, Haitong Tian, Guxin Cui and Evangeline F.Y. Young. 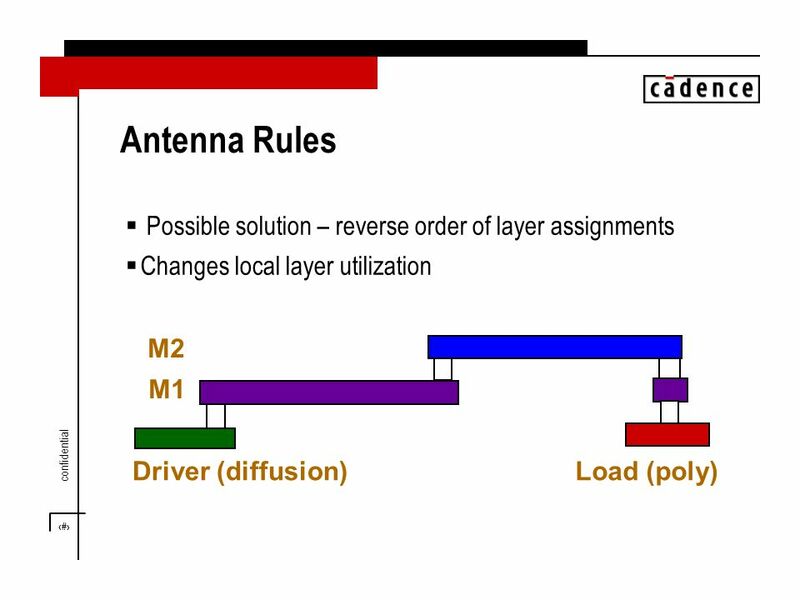 Coupling-Aware Length-Ratio- Matching Routing for Capacitor Arrays in Analog Integrated Circuits Kuan-Hsien Ho, Hung-Chih Ou, Yao-Wen Chang and Hui-Fang. 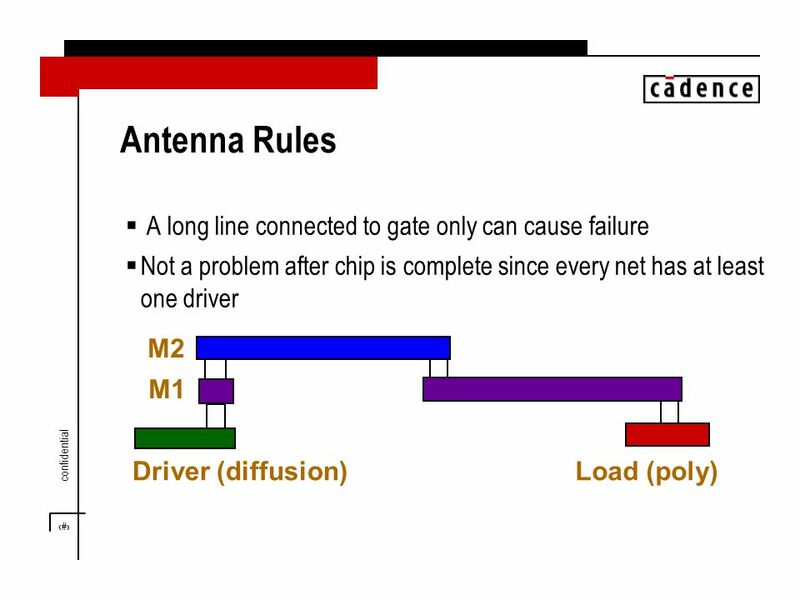 Defect Tolerance for Yield Enhancement of FPGA Interconnect Using Fine-grain and Coarse-grain Redundancy Anthony J. Yu August 15, 2005. 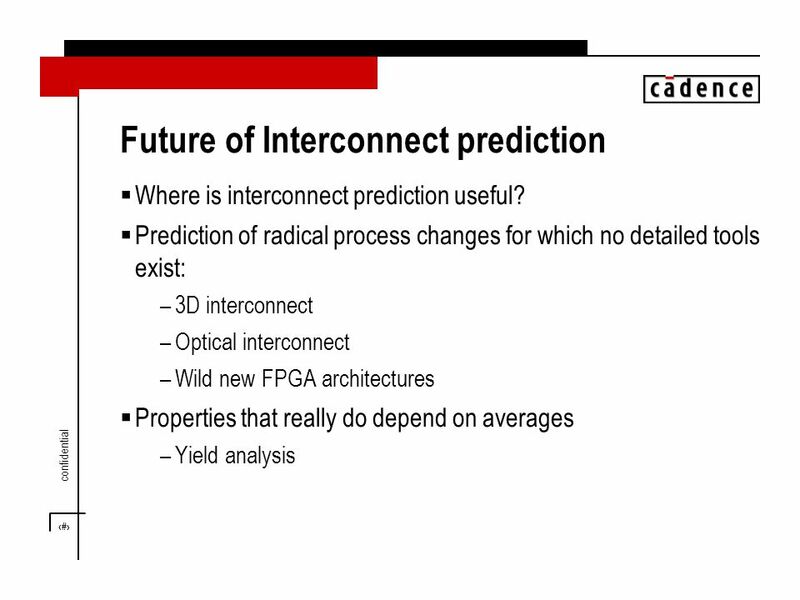 ER UCLA UCLA ICCAD: November 5, 2000 Predictable Routing Ryan Kastner, Elaheh Borzorgzadeh, and Majid Sarrafzadeh ER Group Dept. of Computer Science UCLA. 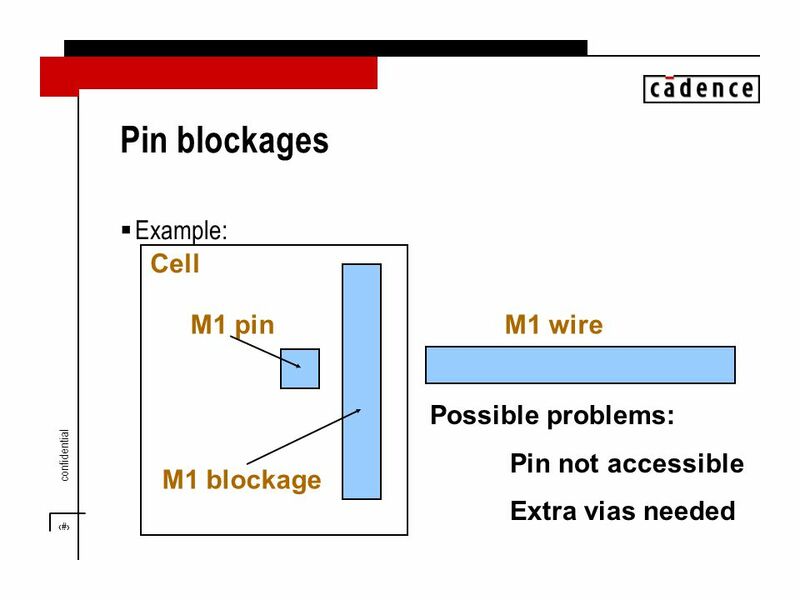 On Modeling and Sensitivity of Via Count in SOC Physical Implementation Kwangok Jeong Andrew B. Kahng. 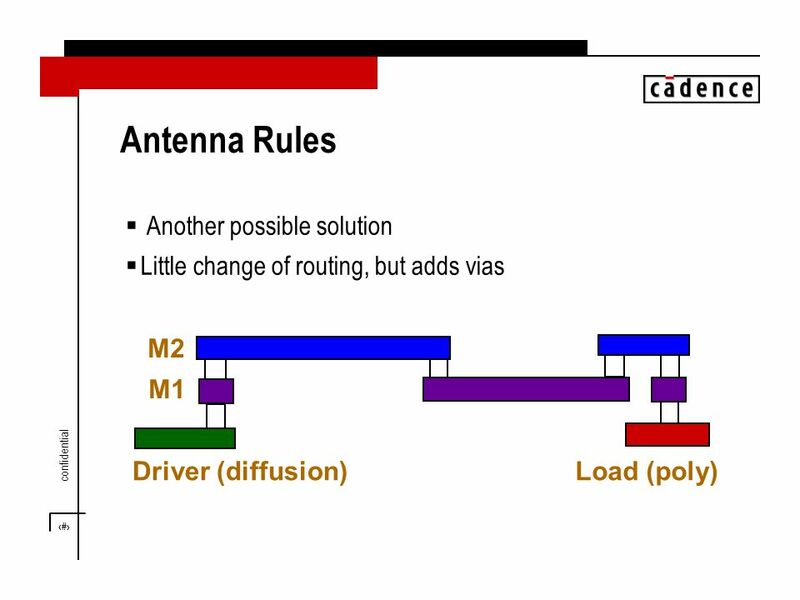 Routing 1 Outline –What is Routing? 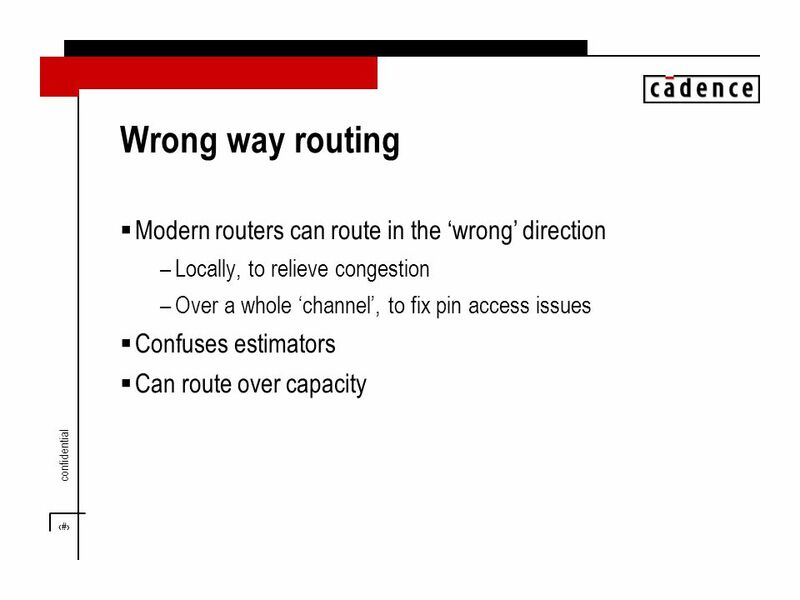 –Why Routing? 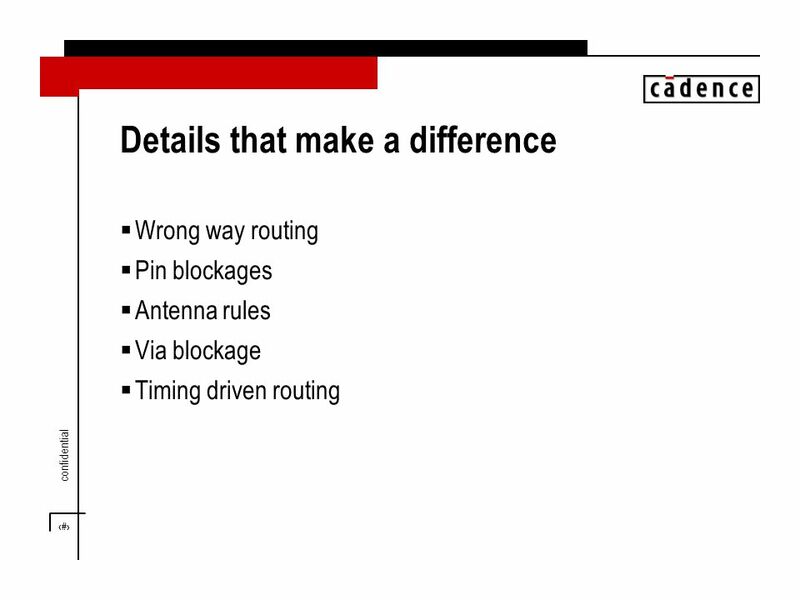 –Routing Algorithms Overview –Global Routing –Detail Routing –Shortest Path Algorithms Goal –Understand. 1 A Tale of Two Nets: Studies in Wirelength Progression in Physical Design Andrew B. Kahng Sherief Reda CSE Department University of CA, San Diego. 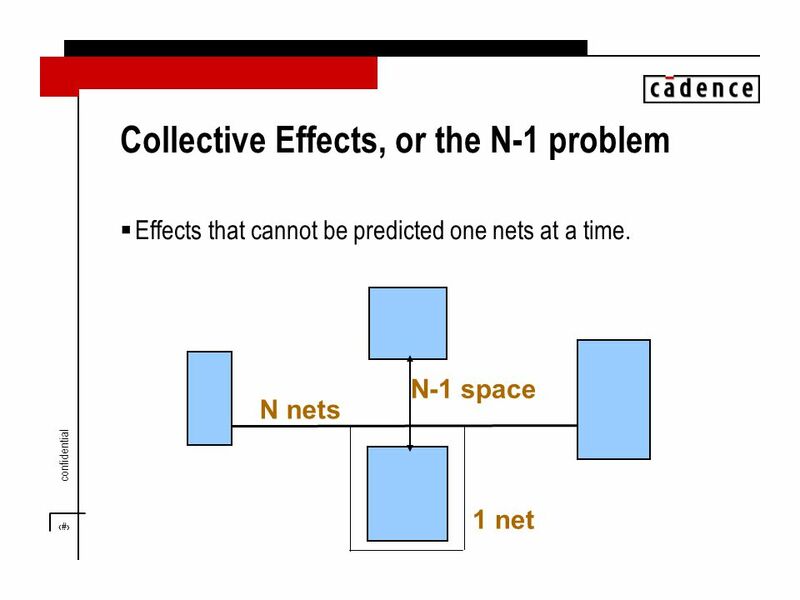 Focus group: Statistical synthesis. 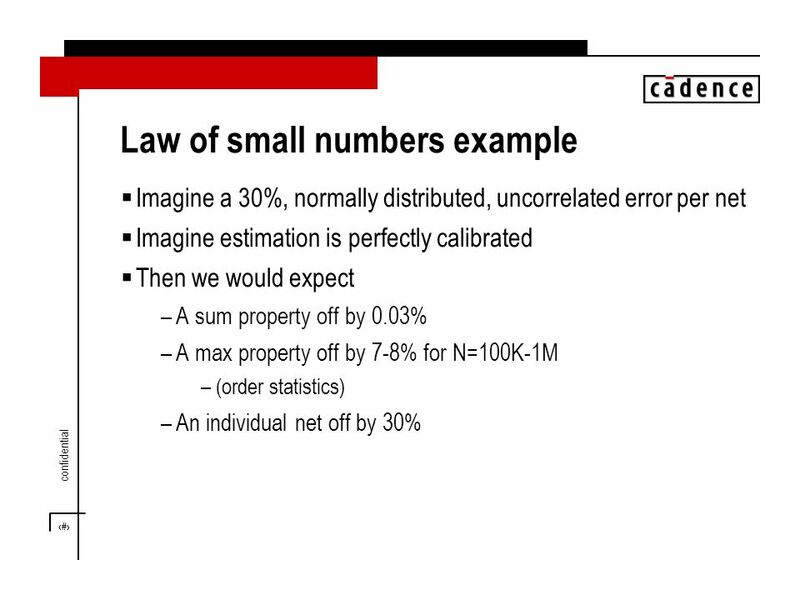 Top reasons to go for statistical Often cited - worst case is way off - exact SI and IR drop analysis is too complex. 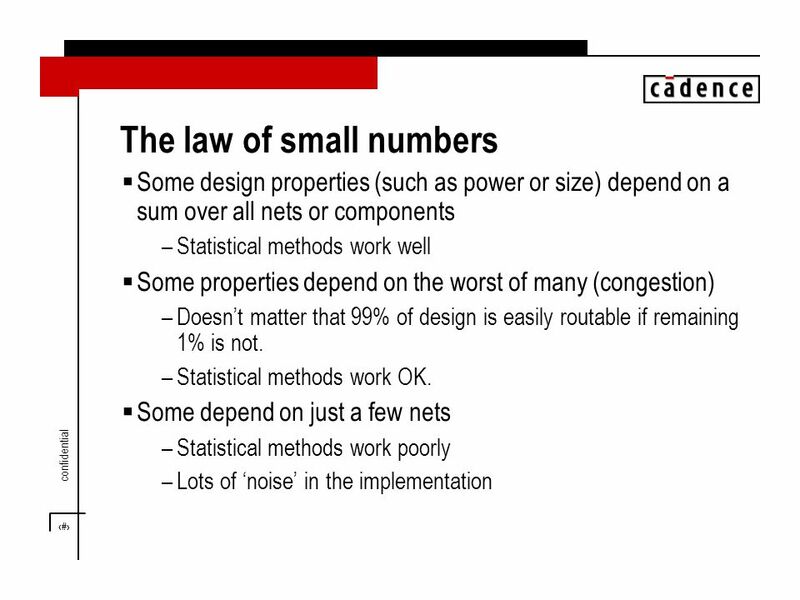 Probability and Statistics in Engineering Philip Bedient, Ph.D.